Are you annoyed with "android system has stopped message".Does "android system has stopped message" not allowing you to do anything.Do you want to get rid of "android system has stopped message".Do Monkey test, Time Service ,Security Plug in are not un-installing from your system.You are unable to do anything.Advertising is constantly displaying again and again due to this virus.These apps are in your System and you cannot do anything with these,No not at all.We have a method to remove and get rid of these unwanted applications which are installed by their selves into your phone's system folder.Time service is prompting again and again along with many other irrelevant apps.This malware is very hard to delete! even if you root your phone and download root applications uninstaller. No android application can fix this.So what can we do? With my Method (PK Helper) You will not lose your Data as we will not reset our phone.I have a simple Fix for all of this Glitch So Follow Me. I have been inflamed with the aid of a Trojan these days on my Samsung S2. I've distinct application which can be established (games and so forth ..) without any notice. My device isn't always rooted. Is their someone who confronted comparable difficulty and could assist me ? Am having same hassle for every week now. I tough reset without connecting to google account and voila.The apps are lower back. I don't realize how or when they were given stuck into the ROM, however they simply re-appear as quickly as you restart.They preserve popping ads by using google and randomly install wasabee.Apk or other comparable utility. so that you hold disposing of them each 5 mins they arrive lower back.. Its so disturbing. Desire they are no longer steeling charge facts from google. Before starting turn off your wifi so "android system has stopped message" could not come up.If its coming continuously and you are unable to do anything so simply go to applications>Running and force stop all below mentioned apps if you find any and disable the apps in All Applications Tab that i described below and then start the procedure to permanently get rid of these apps. If you are using a huawei phone, use this method to root huawei phone.If you are already rooted so move on to Step 5 and no need of iRoot and drivers,Just Titanium Backup will do the job. 2If your phone is not rooted, then install iRoot and Proper Drivers for your device on your Computer or Laptop. 3Open iRoot or Kingo Root and Plug in your android phone into laptop with wire (data cable) and enable Debugging Mode by Going into Settings>Developer Options>Enable Debugging Mode. If there is no Developer Options then Go to Settings>About and Click on Build Number many times untill you get a message that You are a Developer now.After this you can see Developers option in your Settings. 4Click on root button in iRoot on PC or Laptop to Root your Phone.Your phone will reboot and yes you are rooted now.Move on to next step. 5 Install Titanium Backup from the given link and open it and give it root permissions by clicking on Allow button when prompted to do so. 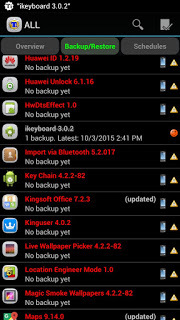 If you misleadingly uninstall any system application then your device will behave strange but don't worry just restore your application from Titanium Backup if you did so.I have mentioned above for which applications backup is necessary.Below are the pictures of applications which i deleted.These are marked with Strike through like android1.0. 7Now go to settings>applications and Disable any application from the above described apps if you find any one of these in your applications list and clear data of all these. 8Now again open Titanium Backup and freeze apps which you uninstalled before if these are still there. 9Here you Go.You are Done.But for precaution, again go to Settings>Apps and Disable any app you find suspicious. The Virus has permanently Frozen and Eliminated from your device.Now Restart your phone and turn on wifi without any annoying "androidsystem has stopped message".If you see these applications again in your system,don't worry because now they can do nothing.They are not in your system anymore.They have Removed but left their names in your root folder.If you want to remove their names as well then open root explorer or any file explorer which can open your root directory or system folder.Go to System>Data>apps and delete above mentioned files. 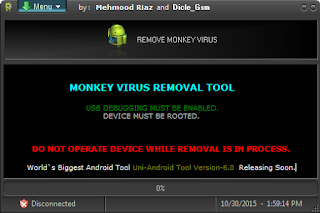 Now you can use the Monkey Test Virus Removal Tool to get rid of these unwanted annoying viruses from your android smartphone without having any further problems. Your phone must be rooted. Turn on USB Debugging Mode from developer options and connect your phone with PC via USB Cable. 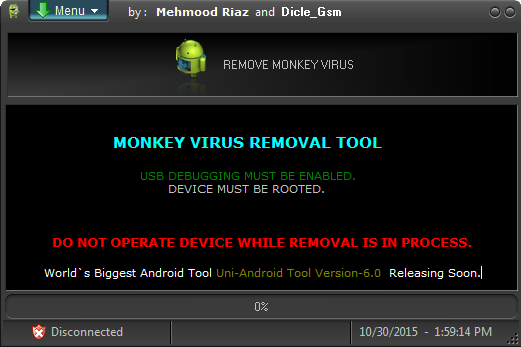 Run Monkey Test Removal and Click on Clean Device/ Remove Monkey Test. You are done. First, you will need root access (you can get by using root baidu, swing with 4pda) and terminal emulator. This Post Is Created by PK Helper.Credit Goes To PK Helper. so after this can i unroot my phone?will unrooting bring virus back? Thx!!! I apparently fixed the Measure - engrick - MobileOCR virus with this tutorial! I'd like to add that after i uninstalled every app with the titanium, virus still continue appearing on my android phone... so i turned the phone into plane mode, then went to settings - apps - all and DISABLE every suspicious app. Now it seems to be working fine. Thanks Dear for your Helping Comment.I already told this in the post but now i will highlight it. Hi my friend. Thanks a lot for your help so far. I downloaded TB from the link you sent me by email and installed it in my S4. Appears am having problems with root. I got the following error message from TB: "sorry, i could not acquire root privileges. this application will *not* work! Please verify that your ROM is rooted, and try again." I used before iRoot and got the succefull message from iRoot. Any idea what i must do? Thanking again. Thanks again. I will do it and will report. The main problem is that when the S4 reboots it takes hours to be ready to be used. So I will report the results of root checker tomorrow. I used iRoot again but unfortunately it did not rooted my S4. Can I eventually use the other root program that you mentioned Kingo root to try to get my S4 rooted to finally use TB to remove the viroses? If so I will be very grateful if you could send me the link to download kingo root. Many thanks again. Thank you for you help. I used kingo root but my S4 is not supported. I will not bother you again since it appears that the main problem to not root the mobile is because it is a chinese clone of S4. So far I tried to root my device using: iRoot, Kingo root and framaroot. No one worked. I am quite sure that your method to remove virus would work fine if my S4 was original. Thank you very much for your attention. Thanks again. I will check the post at XDA. i have successfully removed all these listed virus from my lge gpro e988 4.1.2 after 3 month of trouble so please if there are anybodys mobile infected belongs to kathmandu nepal pls contact. this virus never let you to do uninstall!! antivirus remove! !root permission! !nothings just its totally under its control. does changing the OS makes this virus go? Thank you so much!! I had same experience as box rendering. Fixed the Measure - engrick - MobileOCR virus with this tutorial! And DISABLE every suspicious app. Now it seems to be working fine. They are not in your system anymore.They have Removed but left their names in your root folder.